Fest Info: The world is busy welcoming changes, some major, some minor but each one equally exhilarating. Every innovation, every novelty is highly valued in the fast paced world today, originality being the hauler.We here at the Jalpaiguri Government Engineering College (JGEC) proudly affirm to align ourselves with the changing times; and organize Sristi 2k12, The Annual Techno-Management Festival as an exemplar to showcase our presence in the world of technology. 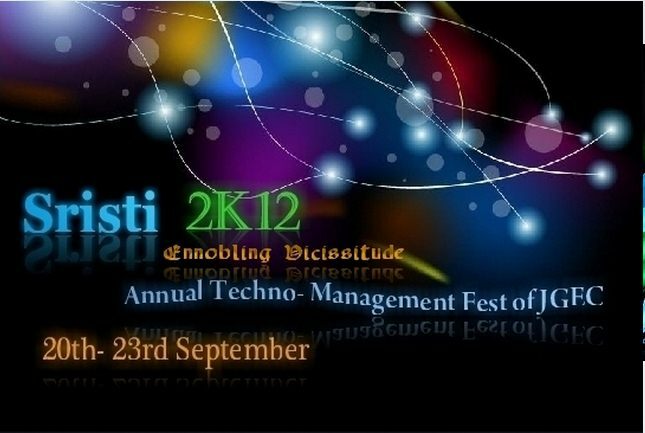 This exclusive annual tech fiesta aims at sparking a flash into the torch of innovation and carry it forward igniting the mind of its bearers.”Sristi”, is a word that brings along many vibrations of the universe. Vibrations that pulsate the mind, nurturing innovation. Vibrations of massive creations. Creations that put down the foundation of advancement and lay the seeds of humanity. In Sristi… conceals the past, the history. In Sristi… germinates and sprouts up the future, the mystery. Handing over the present, the gift. Sristi is the greatest boon bestowed on mankind.Sristi 2k12 calls upon budding engineers, technocrats, innovators and technologists to come and join the brigade of competing young minds. Jalpaiguri Government Engineering College is located squarely in the middle of the “chicken’s neck” covering a land of 160 acres, 42 kilometres East of the business town of Siliguri. Famous Darjeeling Town is only three hours drive from the college campus. Kalimpong, Lava, Lolegaon famous tourist spots are only again within three hours drive. To the North is ‘Dooars’ meaning door to Bhutan. Dooars is famous for numerous Tea Gardens producing world class CTC Tea, Gorumara National Forest and Jaldapara Sanctuary. One can have full view of Mt. Kunchenjangha the third highest peak in the Himalyalas from the college campus. To the East, is the mighty river Teesta. The river Karala flows on the Western boundary of the campus. To the South is the lifeline of the North-East, the National Highway Number 31A.